When a big name performer utilizes quality musicians to accompany their performances the contributions of their sidemen and women can sometimes get overlooked when the glare of the spotlight is on the featured performer. There is also however, another train of thought and that is smart and talented artists surround themselves with people who make them look good and often give them a lot of space, so their talents can be showcased as well. Scott Tarulli falls into the latter category and he has recorded with and / or shared the stage with the likes of, Jerry Marotta, Tony Levin, Mark Egan, Ira Coleman, Nile Rodgers, Steve Gadd, Abe Laboriel, The Temptations, Bernard Purdie, Chuck Rainey, Peter Eldridge and Guthrie Govan. 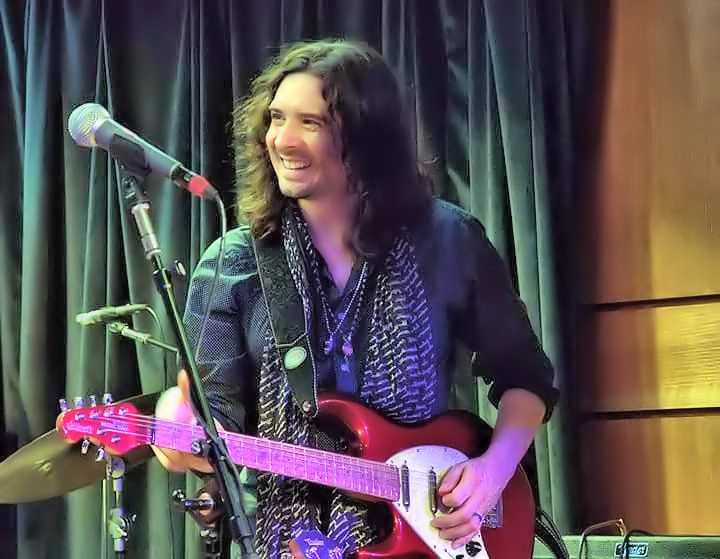 Scott Tarulli has also released three solo albums, Transitions in 2002, September in Boston Live in 2004 and the 2012 release of Anytime, Anywhere. There is also a fourth album in the works for 2017. 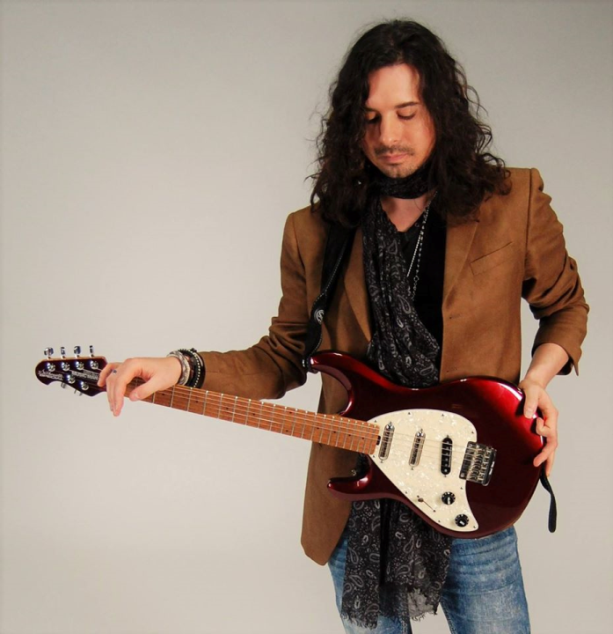 In addition, to being a very good guitarist and composer, Scott Tarulli teaches at Berklee College of Music in Boston. Scott Tarulli’s story begins in Medina, Ohio where his family lived until Tarulli was ten years old. At that point they moved to Boston and he has lived in the Boston area ever since. “My dad’s side (of the family) was very artistic, although nobody actually entered the arts. My mom’s side was very musical. She played piano and she sings. All of her siblings are musical and very natural musicians. I grew up hearing my aunt play, hearing my mom play and my mom played records nonstop. When I was a little kid I grew up on whatever she was listening to, Simon & Garfunkel, John Denver, West Side Story, so I was listening to Bernstein at a young age. It was great. They were definitely artistic people. To be honest I think the first album that I wore out was my mom’s Billy Joel album, The Stranger. It was like when she wasn’t spinning the albums, I was putting them on. The radio was also on, but I was actively putting these records on. My mom took me to Judy Collins when I was six and I remember parts of that show super distinctly. When I saw a bit on YouTube from that tour it is crazy how much I remember. (The music I heard growing up) did have a big impact on me. Absolutely!” says Tarulli. When he got a little older Scott Tarulli’s musical tastes took another direction, “In my teenage years I got into my Heavy Metal thing, which was listening to the Rock of the time. When I was younger there were two kinds of metal I guess There was Black Sabbath. Led Zeppelin pushed the envelope a little bit on that. They were right on the cusp. Then there were bands that they called Pop Metal, like Def Leppard, White Snake and that kind of stuff. Now we just think of it as Classic Rock. There are eighty subcategories of Heavy Metal and I will never understand why there are subcategories. Norwegian Death Metal is more of a Prog Melodic Metal and they have distinctions for it, but when I was young it was just pretty well Classic Rock. I liked really melodic bands with big choruses. That really turned me on as far as songwriting at that age. I do sessions once in a while for that stuff and I still love that music, but it is not really in the forefront of what I do at all anymore. I am happy if one of those records goes on today. It is great music always. As I got older the bands that I listened to in the eighties I thought this is where they came from. The seventies and the eighties were the Arena Rock era. I knew about Deep Purple and I knew about Rainbow. It is cool the distinction between teenager and the years after. I still love that stuff. It’s classic. It’s amazing,” he says. With every artist it seems there is a pivotal moment when they realize music is what they want to pursue as a career, so we wondered when that occurred in Scott Tarulli’s life. “Most people say they picked up the guitar when they heard Jimi Hendrix or they picked up the guitar when they heard Eric Clapton or when they heard Steve Vai. Those people all came later for me. I got this Blue Oyster album Extraterrestrial Live and “Buck” Dharma on guitar. He was making these trippy sounds. It blew my mind. I was kind of in a trance. Then the other thing that (got me) was Gary Richrath from RE0 Speedwagon and at the time high fidelity came out and they had the live videotape that I watched, because my mom would rent it. He had the coolest guitar. It was a ’58 Les Paul. Those were the things that initially made me want to play, plus my uncle has always been a professional drummer. When I was a kid he was already playing gigs and that fascinated me. He would come back and he would wake up at noon and he would say I had a gig last night. That really inspired me to pick up the guitar. I was in bands. The first band was bass, guitar and drums. I don’t have any recordings from that era, but I know it was so much fun. I was thirteen. That band had one gig and it was at a school for delinquent children and I think the bass player went to that school and he got us to play. I don’t remember much about that. It was scary and I was terrified. I played all of the talent shows. Then I started getting involved in bands in high school, thirteen, fourteen, fifteen, sixteen and all the way through to eighteen. I got one of those four track recorders when I was fifteen or sixteen and I was writing instrumental guitar stuff. I was never a very strong singer, but I remember writing four songs with lyrics. I started writing and demoing songs in ninth grade. I have them somewhere recorded on a cassette. I have always written music. I played nonstop and I lifted stuff off of records, Ozzy Osbourne records and Iron Maiden albums. Whatever I could get my hands on I would play. I would find the notes and the chords and the licks. That is what I did. I didn’t do homework. I wasn’t a good student in high school. I didn’t become a good student until I went to college. I played talent shows in other towns and anytime somebody wanted to play I did. There is a videotape that my friend who moved to London has and I was sixteen. We had an assembly and we did songs of the time. I remember us being really good for a bunch of sixteen year olds. We really had fun. Literally I would come home from school and I would play for three hours. My mom would call me for dinner and I wouldn’t go up for dinner and I would go up at ten and the lights would be off. People would say I was obsessive compulsive I guess, but I was really wrapped into that world. The music made me happy. I really didn’t have a great high school experience, because I was bullied and excluded. For some reason a lot of people who felt the same way gravitated towards the same kinds of bands and they felt some kind of comfort from the music. I just got obsessed with playing it I guess. I didn’t really care if anybody heard me at the time, but I did like to play live,” says Tarulli. Scott Tarulli’s association with the Berklee College of Music began long before he started teaching at the school. When he was seventeen years old he attended the summer program at Berklee. “They thought I was dumb. I just wasn’t doing homework or anything. I got into UMass Dartmouth by audition. It is cool. I got accepted and that was amazing. I was going to go there for music and the week that I got there I saw an ad that a band was looking for a guitarist and it was a band called This Side of “7.” I responded to it. I auditioned that week and it was all older guys. I was eighteen and I think the second youngest guy was twenty-nine. I did a reunion with them maybe eight years ago and it was like a mix between the first three U2 albums and The Cult. They were weekend warrior types, but I learned a lot from them from writing with them and what guitar parts would work in a band situation. It was a killer band. I was with that band for three or four years and we gigged a ton. It was original music. Jack Darling was a big deal in the eighties in Boston. He was an amazing songwriter and I loved the songs that he wrote. It was my first time with guys who had a history in the music business and my first time hanging out at clubs. It was also my first time dealing with audience members and club owners. It was a crash course, but I was in heaven,” he says. As a new century dawned, Scott Tarulli started thinking about his first album and in 2002 Transitions was released. “I was just touring and being a sideman. I was playing maybe eight to ten gigs each week, because there were a lot of doubles and triples and I stopped writing music for the most part in the nineties. I sat down and started to revisit my compositional learning from college and I tried to put things together in a clever way. It really took a while to write the songs that are on that. I like the songs on that album a lot and because of budget I think we tracked the album in a day and one-half. I like how the album sounds, but there are things I look back on and think ah I should have done this. It was a big learning experience for me (as far as) being a band leader and doing an album rather than being directed by a producer and doing an album. When you are a session player you learn to do what the artist envisions. Now when I was doing my guitar sounds I was very conflicted about what it should sound like. There are some things that I feel I definitely made the wrong choice or I was going for the sound that I shouldn’t have been going for. There are other things that I think I nailed it. It was a learning experience in the sense that I wasn’t really ready to trust myself when self-producing. I was like a deer in the headlights. We would do a take and listen to it and I would go oh my god. Do we sound tight as a band? Keep in mind I only had a day and one-half to track this album, which is pretty intense when these aren’t guys that you play with all of the time. I learned that you can’t rush it and I learned that I needed to trust my own judgement. The important thing about that album is that is me coming from being Mr. Sideman to being in charge. Compositionally it was me and I think that a lot of the playing was, but some of it was maybe overthought. I have had people tell me that some of the stuff I hated on the album they loved. I guess I learned a lot there too when it came out and people said I love this and I loved what you played here. I thought that was really strange and I would thank them, but I thought it was terrible,” he recalls. Two years later when an unexpected physical condition with Tarulli’s hands almost brought a premature and catastrophic end to his music career, he decided to release what he thought might be his final album, September In Boston Live, in 2004. In describing the story leading up to the album as both “cool and scary,” he says, “Around that time I noticed when I was playing gigs my technique wasn’t as good. I was practicing a lot, but my dexterity disappeared and the thing with guitar players in Rock and Blues is you bend a note into another note, but I was finding that I was losing strength in my hands. I went to doctors and to physical therapy and nothing helped. It was getting worse and the reason that I did that album and the reason that it is live is I thought if the (condition) got worse in a year I may not be able to play at all. I wrote four songs and they were ambitious songs. Then I took four songs from Transitions and put them in the sets. There is this club called the Abbey Lounge in Boston and my brother who wrote the liner notes (describes it as) a beer soaked hole in the wall dive, but it had some character to it. I rehearsed a lot with the band. The music was more complicated than I wrote and I don’t know why. I really worked hard on the writing for that. We did two similar sets, but the same songs were in the two sets, because I was going to choose the best out of the two sets for the album. About the 2012 release of Anytime, Anywhere, Scott Tarulli says, “I was really psyched about this album and I really liked what I was writing. To be totally candid I was about ready to go through a divorce and I knew it. I wrote this album when I was going through it and it came out when I got divorced. It was an interesting time. Compositionally I like it, but it is really my plane and my sound choices and how the album is specifically meant to sound from beginning to end (that I like). It points back to things. It is an emotional snapshot of what I was going through. I was a very different person during that time. I was on a record that Jerry Marotta was producing and I couldn’t believe it, because he was one of my idols and he was on all of the Peter Gabriel albums and he played with McCartney and Hall & Oates, Cher and all of the David Foster records. He was on most of those. He is an Italian guy, a sweetheart, so funny and we just hit it off. He liked my playing and he hired me for something else and he said do you ever write your own stuff? I said yes actually I do. I said I am ready to start an album now and he said why don’t you come and record it at Dreamland, which was his studio. Elvis Costello, David Sylvian and Paul McCartney have recorded at. I said Jerry I can’t afford this place and he said come on and I will play on it. I said Jerry I can’t afford this place and you (he chuckles). I said you are like a triple scale drummer and you have played on some of the biggest albums in the world. He said come on I will give you a good rate, let’s check it out. I said I don’t want to impose, but Tony Levin lives up in Woodstock, New York and he is one of my favorite bass players. He is a very textural, linear, lyrical bass player. He was on everything, Pink Floyd, John Lennon and he is probably one of the most recorded bass players alive now. (Jerry) said he is my best friend, here is his email. You ask him. There is a reason that a guy like Tony is on almost every album, because he is one of the most professional people that I have ever worked with. He was so cool and he said send me the tracks. He was super humble. He came in with six bass choices and he had written his own charts to every one of my songs. He said I really worked on this and my jaw dropped, because I know local people who come in and go, where’s my chart? The tracks with Tony were tracked live. There was Jerry, Tony and me in a circle. I couldn’t believe it and I still can’t. It really worked out, because the recent album that I was working on for Jerry, Tony Levin was playing bass on that too. I ended up doing two tracks at Dreamland. That album (Anytime, Anywhere) is not where I am now, but that became my repertoire. I stopped playing anything from the first two albums and any time that I played out it was Anytime, Anywhere. I was thinking of Transitions when I was (recording) this album and I was going to take my time. That album took a year and one-half to do, but there were months when I didn’t play anything. If I had condensed it, it might have taken one month with mixing and mastering included. Mindi Abair (who played saxophone on the album) and I have known each other for years and she was in town. She remembered me. She said I hear you are doing an album and she said why don’t you send me a track? I said I actually do have one track that would be so perfect for you. I sent it to her. When she got off the road she sent me two different takes of me playing over it. When it was over I was oh my god. I was wow, do I owe you. Dave Tronzo the last person to talk about is a genius and Dave is one of my favorite musicians. I hang out with him. He teaches at Berklee. He is one of the kindest people, one of the brightest people and one of the most innovative players. When I say that everything he plays is invented in the moment in his voice and nobody else’s that’s an art. I can’t say that about myself and I am really working towards that. The tune that he is on is called “One Year,” which might be one of my favorite tracks on the album. What you hear on “One Year,” is absolutely live. It is totally live with not one overdub. It is him, a B3 player, drums and bass and me. I think we did two takes or three takes and we chose the second one. He really added a lot to that. He is beyond a guitarist and he is beyond a musician. Someday I would like to do a whole record with him. He is so inventive and so egoless. It was magical. That album Anytime Anywhere is probably the best experience I have had making an album.